In a matter of months, Stacey Abrams has gone from losing the Georgia governor's race to being a heavily recruited Democratic star, urged to run for Senate and mentioned as a possible presidential contender. It's a dramatic rise often fueled by the promotional spending of Fair Fight Action, a nonprofit she founded to advance voting rights. The organization has paid for advertisements featuring Abrams and some of her travel and organized national watch parties when she delivered the Democratic rebuttal to President Donald Trump's State of the Union. But spending by Fair Fight Action, which is staffed by former Abrams campaign aides, could prompt questions about whether the nonprofit is inappropriately supporting her political ambitions. Although there is no proof of any illegal activity, some of the organization's expenditures could pose a problem if Abrams follows through with her pledge to run for office again. On Wednesday, a GOP-affiliated group called the Foundation for Accountability and Civic Trust, or FACT, filed a complaint with the Internal Revenue Service. The group points to roughly $100,000 worth of Facebook ads featuring Abrams, an advertisement for a "Stacey Abrams Fundraiser" that featured Fair Fight Action's logo, travel for Abrams' post-election "thank you" tour of Georgia and a professionally produced "highlight reel" of Abrams footage on the group's website. The complaint argues Fair Fight Action is supporting Abrams' political ambitions, not advocating for voting rights. That's a violation of tax law that forbids political 501(c)(4) nonprofits from providing a "private benefit" to a particular person or group, according to a copy of the complaint provided to The Associated Press. The group typically files ethics complaints against Democrats but has also targeted some Republicans, including North Carolina Rep. Mark Meadows, a leader of the conservative House Freedom Caucus. Fair Fight Action CEO Lauren Groh-Wargo, Abrams' former campaign manager, disputed the details of FACT's complaint. 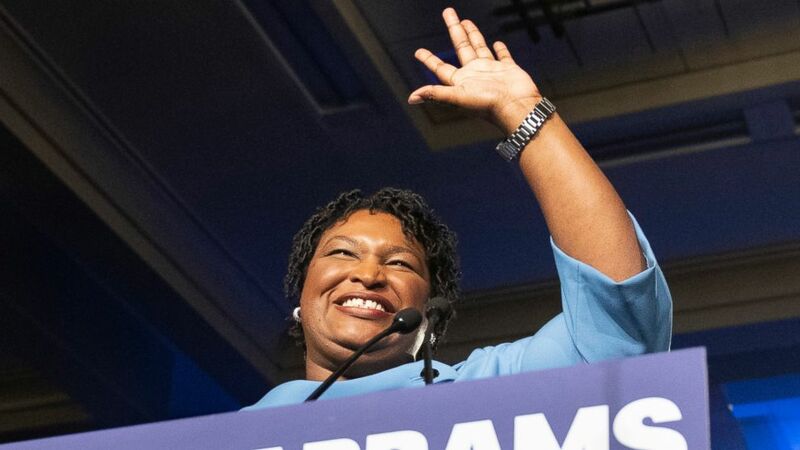 She said that while Abrams is the figurehead of the organization, Fair Fight Action's promotional activities have always focused on voting rights issues. "It's no surprise that right-wing hit groups allied with Donald Trump are launching bogus attacks against Fair Fight," she said in an emailed statement. "They're afraid of Stacey Abrams and even more afraid that all eligible Georgians will exercise their right to vote." It's not unusual for politicians to have a nonprofit or be supported by one staffed by their associates. The group Our Revolution backs Bernie Sanders' White House bid, but the Vermont senator does not have a direct role in the group, according to its most recent tax filing. Trump has a nonprofit staffed by allies that is facing a complaint pending before the FEC. For nonprofits like Fair Fight Action, which can raise unlimited sums and engage in political activity, steps are often taken to at least give the appearance of being kept at arm's length from the politician they support. But Abrams serves as the chairwoman of Fair Fight Action's board, giving her a direct hand in the group's management. After Abrams lost the governor's race, the nonprofit was overhauled. She became the chairwoman, stepping down as CEO. Groh-Wargo began running the operation. Language forbidding the group from promoting a political candidate was stripped out of its charter, records show. The group also took over the Twitter account used by Abrams' gubernatorial campaign and renamed it Fair Fight Action. The group's leaders say all its activities focus on highlighting the need to protect voting rights in Georgia. Furthermore, they say, staff members carefully separate voting rights work from more overtly political activities done by newly formed Fair Fight PAC, which does not have to report its fundraising and spending to the FEC until April 15.